Moviepin is the PUP that uses misleading techniques to prevent removal. Use Reimage to locate malicious components and get rid of them faster than with uninstall instructions. A full system scan blocks virus reappearance and prevents traffic to malicious domains. Moviepin is a suspicious domain that promises a movie streaming service to users. However, many complained that they did not visit the site intentionally. In most cases, users get redirected to aczepi.moviepin.tv, register.moviepin.tv, api.moviepin.tv and similar subdomains because they have adware program installed on their PCs. The potentially unwanted application infiltrates computers with the help of software bundling – a deceptive marketing technique used by shareware authors. The adware quickly modifies settings of Chrome, Firefox, Safari or Internet Explorer, and starts disturbing users with unwanted links, redirects, and pop-up ads. 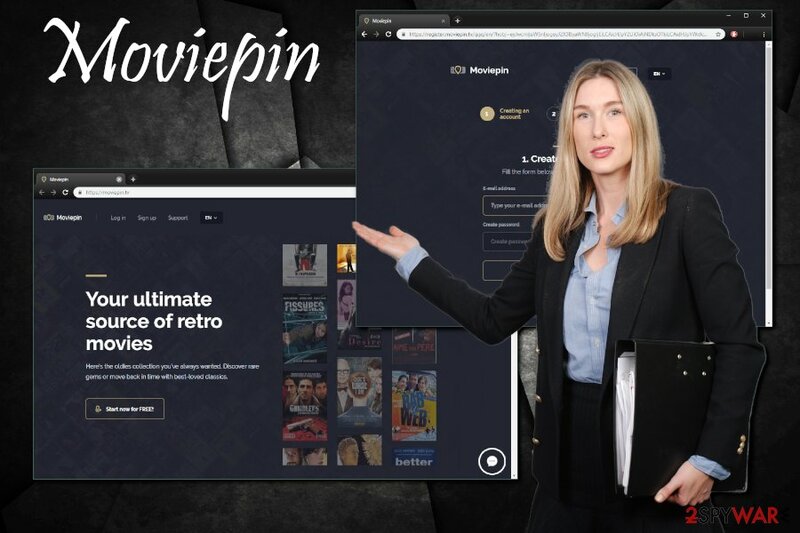 As soon as users land on Moviepin website, they are often tricked into registering for the service, providing their credit card details, email, and full name and putting their privacy at risk. Symptoms Redirects, pop-up ads, sponsored links, etc. 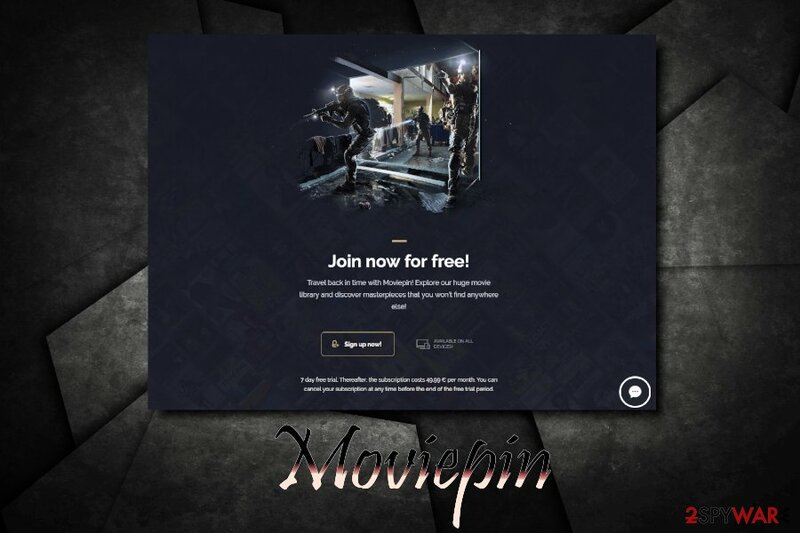 Moviepin-type services is not a new phenomenon – there are thousands of similar sites online suggesting attractive offers, such as unlimited music or films. While many users are aware of deception these sites are using, there are still plenty of people who would fall for the trick. In such a case, Moviepin removal might not suffice, as the personal details disclosed already might be compromised. The service is compatible with all devices. However, as soon as you start to look around, you can easily notice deceit. You will not be able to view the database of suggested movies unless you register, which requires you to share personal details with Moviepin. A free trial sounds good, right? Well, quite a few users mentioned that they simply wanted to download an e-book from Moviepin and then cancel the service. However, the cancelation process turned out to be much harder than it should be, as users were asked to contact their banks and open a dispute. This led to many unsatisfied posts on Reddit, many claiming that they lost hundreds of dollars to the Moviepin scam. If you accidentally got redirected to Moviepin, make sure you do not provide any personal details and find a legitimate service for movie streaming. If you are keep getting redirected to the site, you will have to remove Moviepin adware from your computer. The easiest way to do that is by using security software that specializes in potentially unwanted programs. However, you can also use our manual guide below to remove all suspicious entries installed by Moviepin. We also recommend scanning your machine with tools like Reimage to fix Windows Registry or other settings that might have been altered by Moviepin virus. Software bundling is an effective way to distribute software, and, if done right, benefits both – users and developers. However, in most cases, bundling is often used as a cheap and deceptive way to inject potentially unwanted programs into as many users' machines as possible. For that reason, the technique is often associated with bloatware programs that do not benefit end users at all. Remove all the ticks next to optional components before you proceed with the installation. Moviepin is an unsafe service that should be avoided. However, if you see your browser constantly redirecting you to one of the subdomains, you should immediately take care of Moviepin removal. The adware program that is hiding inside your PC might be under any suspicious entry, so it is vital to uninstall each of the applications that look suspicious to you. Alternatively, you can use security software to remove Moviepin virus from your computer. Simply download one of the trustworthy programs and run a full scan. If you registered with the website and already paid money, you should contact your bank and ask for a refund (if you did try to cancel your subscription within seven days of registration). Additionally, you should change all your passwords, primarily if you use the same one for multiple accounts. Here, look for Moviepin or any other recently installed suspicious programs. Wait until you see Applications folder and look for Moviepin or any other suspicious programs on it. Now right click on every of such entries and select Move to Trash. When in the new window, check Delete personal settings and select Reset again to complete Moviepin removal. Once these steps are finished, Moviepin should be removed from your Microsoft Edge browser. Here, select Moviepin and other questionable plugins. Click Remove to delete these entries. Now you will see Reset Firefox to its default state message with Reset Firefox button. Click this button for several times and complete Moviepin removal. Here, select Moviepin and other malicious plugins and select trash icon to delete these entries. Click Reset to confirm this action and complete Moviepin removal. Here, select Extensions and look for Moviepin or other suspicious entries. Click on the Uninstall button to get rid each of them. Now you will see a detailed dialog window filled with reset options. All of those options are usually checked, but you can specify which of them you want to reset. Click the Reset button to complete Moviepin removal process. ^ Is Moviepin a reliable book download website?. Reddit. Social network. ^ SenzaVirus. SenzaVirus. Cybersecurity experts. This entry was posted on 2018-12-03 at 05:25 and is filed under Adware, Viruses. You can quickly scan the QR code with your mobile device and have Moviepin manual removal instructions right in your pocket. How did you remove Moviepin?